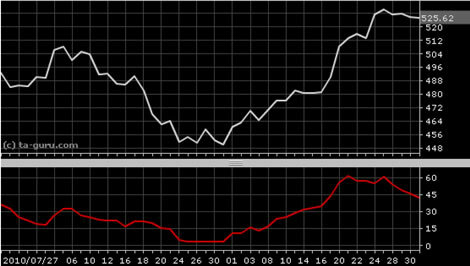 Positive directional indicator (DI+) is component of average directional index (ADX). If DI+ is sloping upward, it is signal that uptrend is increasing. Indicator was developed by Welles Wilder. True range (TR) indicator is used in calculation. For n parameter is usually used value of 14. Positive directional indicator is usually plotted with negative directional indicator (DI-). For details, see directional movement system (DMS) or average directional index (ADX). Open chart for google with DI+ indicator.